When I was a kid, I didn't fit in with the "in crowd." I was introverted, overly sensitive, bookish, and hopelessly out of touch with current popular culture. Part of my cultural ignorance can be attributed to the conservative values widely held by part of my family that deemed most of popular culture trash. Trash that could potentially cause irrevocable harm to my soul. The content that was imbibed in our home was censored. I know that the intentions were good. The long-term results of this censorship are questionable at best. But that is a post for another time. A Childhood of Bad Movies. Really bad movies. Another reason for my state of pop culture un-enlightenment was the media content that was preferred by my dad. To say that my dad's tastes are different is a drastic understatement. My dad has a contrary, rebellious streak that delights in difference. My dad loves obscure, absurd, ridiculous things. His favorite TV show is Lost in Space and I grew up with Penny and Will Robinson. My dad loves low budget B-movies. Think the movies riffed on Mystery Science Theater 3000 without the riffing. I saw Plan 9 From Outer Space (https://www.youtube.com/watch?v=u2ukRYsYPmo) and knew much of Ed Wood's biography in elementary school. Yes, even the Glen or Glenda stuff. I remember Galaxy Invader. (https://www.youtube.com/watch?v=geK_EvPFzao). I remember Battle Beyond the Stars (https://www.youtube.com/watch?v=ksJTPdNNQB4). Seeing these movies, watching them with my father-who truly, unapologetically loves these films-impacted me during my formative years. The experience undoubtedly influenced me: what I enjoy, and what I enjoy about it. Especially Star Wars. Growing up with these cheesy movies gave me an ability to look past poor effects, or at least to smile at them. Maybe it is because I'm not a very visual person, maybe I've been inoculated against badly done special effects by seeing so many Ed Wood movies. I'm not taken out of a story because of poor effects. In fact, I have a fondness of some of the cheesier effects in Star Wars, like Ponda Baba's amputation in A New Hope. As someone who is sensitive to violence, I honestly prefer the less-realistic effects and find them easier to watch. And after seeing paper plates floating from visible strings fill in for UFOs in Plan 9, I'm pretty forgiving about effects. If you watch Plan 9 From Outer Space you will notice an astounding amount of things to scorn: a nonexistent story, laughable effects, terrible acting. In fact, while shooting the movie, the star, Bela Lugosi, passed away. Ed Wood cast a completely different actor to finish the film, instructing him to hold his cape over his face to disguise the change. Yes, really. Plan 9 is often touted as the worst movie of all-time, and in my opinion, it has earned its standing. It's terrible. 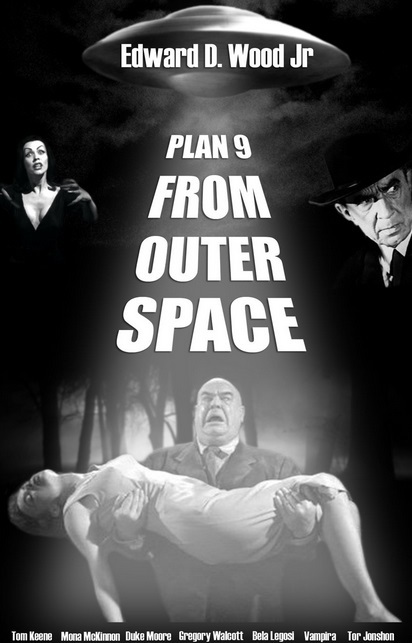 But when I watch Plan 9, I just laugh. It is the perfect storm of a bad movie, but I can find some enjoyment in it. I've learned to find delight in the absurd, the ridiculous. It's why I love the classic Marvel Star Wars Comics and The Holiday Special. It's why I love Jaxxon. It's why I want to make Hoojibs canon. It's why when I read about Lumpawaroo in Empire's End I teared up. It's why I'd rather watch Return of the Jedi way more than Empire Strikes Back. It's why Luke's line about Tosche Station is one of my favorites from A New Hope. I find a kind of perverse joy in the things that make fandom purists cringe. That is likely some of my dad's contrary nature coming out in me. But it is also likely due to watching many terrible movies and learning to not take things like movies too seriously. If I could quote one thing I have heard my dad say more than anything, it would be "Never let continuity get in the way of a good story." His disdain for things like canon and a cohesive universe is strong. There was a mistake with a background character, ship, or battle? That makes it more interesting, not less so. Fans that scour all the new literature trying to catch mistakes, or feel that such errors lead to decreased authenticity (in fictional universes, no less) are cheating themselves out of the enjoyment that comes with a broader acceptance of what is acceptable in how a story is told. The best solution I've found for this is simple, yet it can be difficult. If you don't like a part of a story, part of a Star Wars movie, ignore it. Midi-chlorians make you see red? Disregard them. Still hung up on the Prequels? No one is forcing you to watch them. Take the parts you like and focus your energy on them. If I would've given up on Plan 9 at the first hint of how terrible it was I would've missed a lot of laughs along the way. The most important lesson I think I learned from all of these terrible movies and my dad's interest in them is the power of doing what YOU like. Finding your passion, being yourself, standing out in the crowd. Having the confidence to not care what others think, to find what you love and love it regardless of outside opinion. Thanks for living that out Dad. Those are lessons I'm still internalizing and lessons I want to teach to my own kids. But maybe without watching Galaxy Invader again. Did Anyone Else Notice Ahsoka in the Thrawn Novel Besides Me?